Apple says the Apple Watch is only water-resistant, and therefore shouldn't be submerged for long periods of time. But what exactly constitutes a long period of time? And how deep can it go before encountering difficulties? One man set out to find out. His name is Ray Maker, and he posted a series of videos showing him taking the Apple Watch for a dip. First up, a 25-minute swim, covering a distance of about 1,200m. The device shook it off like water on a duck's back. The only snag? The heart rate monitor played up a little. But that's not exclusive to the Apple Watch. Next, Ray took it down in a waterproof chamber with the pressure equivalent to 40m deep. Again, no trouble. Then it was time for the big test. Wearing the Apple Watch, Ray flung himself off a 5m diving board and then a 10m board (actually, he got a friend to do the latter). And it came out fine. So why is Apple so coy about its waterproofing abilities? It's not shy about its other skills. There's a chance it hasn't carried out such extensive tests itself and so is loath to bestow it with such accolades. Imagine the flood of complaints if it said it was waterproof and then it started playing up under water. It would make tattoogate look like nothing. It might also want to dissuade people taking its tech into the water. 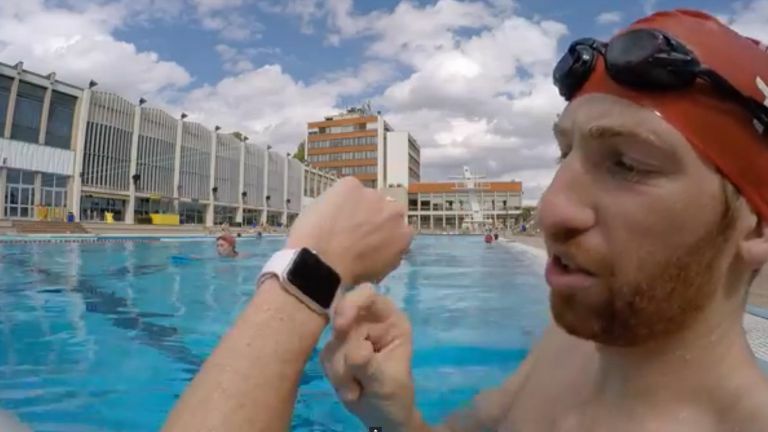 The iPhone isn't waterproof, but if people think the Apple Watch is, chances are they'll take both into the drink to try and make use of all its functions underwater. That would be a very costly swim. Apple Watch owners can rest assured – if it can withstand these kinds of tests, it'll easily handle a shower and a sweaty gym session. Play on, lovers of all things wet. Apple Watch review: How does it score?